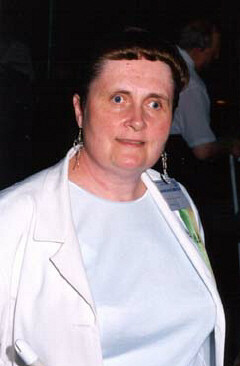 From the Editor: Ramona Walhof serves as Secretary of the National Federation of the Blind. The following piece appeared in Oh Wow!, the eighteenth in the NFB's Kernel series of paperback books. It begins with President Maurer's introduction. Color as it relates to blindness has always seemed to fascinate people. Does color have any meaning for a blind person? How does a blind person learn about color, and how can it be dealt with on a daily basis? Why is it O.K. to wear blue with green now and sometimes even red with pink, when thirty or forty years ago those combinations were strictly prohibited? When I was a child, there were many things to learn. My earliest teachers were my mother and my older brother. My mother intended to teach, but my brother was busy asking questions. Sometimes his questions were boring, but often they were interesting, and I learned as much as he did. I remember a discussion when I was very small, and my brother was asking how brown could contain three colors. I had only a very little bit of vision and largely could not tell colors at all. I could see contrasts between light and dark if the pieces of color were large enough. Brown looked like black to me. Blue and green were absolutely indistinguishable. Red was sometimes bright enough for me to see. But the business of how there could be three colors in one was beyond me. I realized that it would be easy to repeat the fact whether or not it made sense. This became my practice when people talked about color. Most people thought color was important. I was expected to be interested in the color of my clothes, the color of the floors and walls in our house, the color of toys, and the color of pictures. Sometimes I could see outlines of pictures even in the catalog, but seldom did I see colors. I really didn't understand that I could not tell colors apart because I couldn't see them. I did understand that I would call negative attention to myself if I didn't know what color things were. When still very young, I learned that people reacted to color in different ways. People liked red dresses on me, but you couldn't ever put in a pink hair clip when wearing a red dress. And you couldn't wear green with blue either. Navy was dark, and aqua was light, but the different qualities of those colors were harder to understand. I wanted to know why blue could be both light and dark, but yellow and pink largely could not. Much of the information I learned about color just had to be memorized and used. My mother and my aunts and grandmothers liked flowers, clothes, and sewing; and they talked about colored furniture, pillows, craft materials, and more. I found these things interesting, so I had to deal with color, and I wasn't unhappy about it. Packages of modeling clay came in four colors, and when they all got mixed together, they looked gray to me. Others could still see the original four colors. Someone explained that the clay never completely mixed together, but little bits of the original four sticks could still be seen. We always had a big ball of clay which we played with on the card table and made everything from house plans to animals to airplanes. As I grew older and began to make and buy my own clothes, I generally sought advice from my mother about what colors looked right together. While I was away from home at the school for the blind nine months of each year, my mother was not available. I just remembered which blouses and sweaters went with certain skirts. There came a day when my mother recommended that I wear a light blue blouse with a dark green skirt. This was a shock, but attitudes were changing. She also recommended that my sister wear a light pink blouse with a dark red skirt. This color business was not so simple. In high school I learned about color wheels and rainbows and the absence of light versus the reflection of light. This was not nearly as interesting to me as how to match clothes and decorate rooms. Red and pink flowers made a nice bouquet, but you had to be very careful with those colors everywhere else. Mostly sighted people agreed about this, but they didn't explain why. When my daughter was a toddler, one of the things she began to learn was to identify colors. Since I always learned what color her clothes were when we bought them or when she received gifts, it was easy to coach her on the colors of her clothes. Pictures in books were a different matter. We had to ask for help. This did not bother Laura. She accepted it as a fact of life. And she was very proud when she could tell others the colors of her toys and clothes. We had put up nursery wallpaper in her bedroom, and she could pick out all the different figures and tell us what colors they were. When my son was a toddler, he was not nearly as anxious to please, and he had no interest in color. He did learn the names of the colors, although not as early as his sister had. He had strong preferences about what clothes he wore. He liked soft and stretchy things. Jeans and corduroy pants were not his choice even after they were well broken in. He really did not want suggestions about what I thought should be worn together. I learned to check his choices of clothes closely. I knew that, if he wore clothes that did not match, people would say that I did not know it. Chris must have been three years old when he received for Christmas a pair of striped knit pants with a plain colored stiff cotton shirt. Laura received a one-piece pantsuit to match. Chris chose a plaid flannel shirt which he wished to wear with the striped pants. To make matters worse, the pants had an orange stripe, and the shirt had purple stripes in the plaid. It would not do! So I did my motherly duty and told Chris that he could not wear those two garments together. Not surprisingly, he wanted to know: Why not? "Because they don't look good together," I explained. But Chris did not agree. "Well, I like 'em," he insisted. To this day Chris seeks advice from his sister and his girlfriend about the best color combinations. It just doesn't matter as much to him as to many people. When Chris informed me of his opinion about the purple and orange, I realized that my children had been learning about color in some of the same ways I had done as a child. Although they could see the colors and identify them, they were not born knowing what is considered attractive. They learned that from their culture. Some blind children have more interest in color than others, just as some sighted children do. They vary in creativity and responsiveness to those around them. Some care more about cars, while others are interested in clothes or flowers. A child with a little bit of vision may be interested in painting or coloring pictures, while many blind children find the waxy feel of the crayons or the soupy feel of the finger paints more interesting. And some have no interest in either. After an adult loses vision, he or she may retain a lot of interest in color, but some do not. When I was in high school, I chose to write an essay about a sunrise. I wasn't trying to prove anything about blindness. I figured people "oohed" and "ahed" about sunsets all the time. As nearly as I could tell, sunrises were just as impressive and received far less press. I sort of liked to face the day before the rest of the world, and I thought you could make a case that sunrises were underrated and under-observed. That is not an original idea, and many others far more gifted than I have made similar observations. Still, when I was a sophomore at the school for the blind, my essay was considered unusual. It may have been one of those instances when people overreacted to a blind person who could speak the language. I had no idea I would generate so much response, but now (looking back) it does not surprise me. The technique I used was simple, and I still use it all the time for all kinds of purposes. I just said what everybody else had been saying all my life. I applied it to a sunrise instead of a sunset. Then I added a dab of how fresh and unsoiled the morning made the beautiful sunrise seem. Well, maybe it was good for a high school sophomore. I no longer have the essay, so I cannot really know. The National Federation of the Blind has taught me that blind people do not need to apologize for different techniques and different attitudes. We live in the same world as everyone else, and we want to have friends and a satisfying social life. This is normal, but we can worry too much about trying to do as others do. One friend of mine has no interest in color. His wife arranges his clothing on hangers so that he knows which shirt or jacket should be worn with a certain pair of pants. He just puts them on neatly and never knows or cares what color they are. I would hate not to know what the colors of the clothes I wear are. But his system works for him, and mine works for me. It is O.K. What I have learned comes in handy. I can talk about color and use it when the occasion makes this desirable. You don't have to see color to enjoy it, use it, and communicate about it. When I speak to classes in the public schools, children often ask how I distinguish colors. I explain that I cannot see colors at all. I learn what color things are by asking others. Then I remember what I am told. Some children find this answer quite reasonable. Others find it inadequate. This just reiterates what I already know. People's attitudes about color vary a lot�both those of the blind and those of the sighted.